↑ Commissioner Linguistic Minorities. 43rd report: July 2004 - June 2005 pp. para 2.4. 2007-07-16 कथं।. 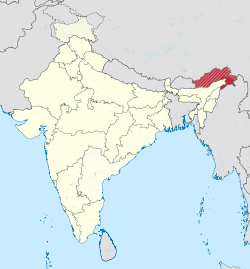 ↑ Five languages spoken by the principal tribes in Arunachal Pradesh - Adi, Apatani, Bhoti, Khampti and Nishi are offered to students in state schools.Commissioner Linguistic Minorities. 43rd report: July 2004 - June 2005 pp. para 2.3–2.4. 2007-07-16 कथं।. ↑ At a glance. Government of Arunachal Pradesh website. ↑ District Census 2011. Census2011.co.in. This page was last edited on १४ अगस्ट २०१६, at ०२:३३.